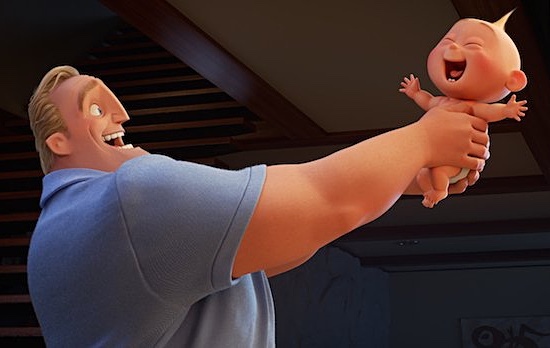 While the soulless “Cars” sequels are made solely to sell more toys, chugging out yet another mediocre entry approximately every five years, the follow-up to “The Incredibles” is released fourteen years later—and it shows. Notice right from the opening action sequence the numerous and seemingly superfluous details. For example, how light hits an object from a certain angle and the reflected light, its intensity, is adjusted based on tricky camera movements and hundreds of other factors, like shadows, around the object of interest. This is one shot. Now imagine this love for detail and level of hard work throughout a handful of fast-paced battles or even when it is just two characters sharing a clever and funny conversation. Freeze every frame and it is highly likely that something in the background is changed even just a little. Pixar delivers yet another home run. Sequels to animated movies tend to annoy me because most of them end up becoming just a rehash of what had worked in the original. “Incredibles 2,” written and directed by Brad Bird, is a shining exception, more within the veins of John Lasseter’s “Toy Story 2” than “Despicable Me 2,” “Hotel Transylvania 2,” or, dare I say it, even “Finding Dory.” I appreciated that this entry is actively interested in world-building: more superheroes are introduced, the politics of their legalization is explored a bit more, we get a villain who relies less on explosions and more on the long game of waiting to strike until all chess pieces are properly placed in order to optimize chances of victory. Most importantly, the veteran writer-director is aware that the most effective weapon of the original is the Parr family dynamics—when they do not have their superhero suits on, when they are just a regular family dealing with regular things, like the pains of raising a toddler and babysitting, of being liked by a boy at school, struggling to get through math homework. The voice cast is top-notch. Craig T. Nelson and Holly Hunter, providing the voices for Bob and Helen, Mr. Incredible and Elastigirl, respectively, have such lovable chemistry. How they emote command such range. For instance, when it sounds as though the dialogue is leading them toward a big argument, like whether or not Helen should accept a curious job that could eventually lead to the legalization of superheroes around the world, the material is capable of shifting suddenly toward sillier territory, like Bob’s jealousy of not being the client’s first choice. In the middle of the picture, I was convinced that the actors must have been in the same room while creating the exchanges because the final product commands dynamism—the kind that we do not feel in our bones when performers simply recite lines by themselves rather than aiming the words toward another person who is within an arm’s length. Context and subtext matter in voice work—especially when conflict is supposed to be convincing. Sarah Vowell, Huck Milner, and Eli Fucile provide voices of the Parr children. Notice I have not detailed much of the plot. This is because the picture is not about the plot and so it is negligible in my eyes. Rather, the focus is on the colors, the energy, the painstaking details of animation, the visual jokes, the clever lines, the surprising and ironic situations. “Incredibles 2” delivers on providing a terrific time. I was in high school when its predecessor was released. I have a career now but this film, even though it has some familiar elements, inspired me to lean forward with my childlike eyes, a big smile plastered on my face. Great review, Franz! :) Really love your last line here in the review, it “inspired me to lean forward with my childlike eyes, a big smile plastered on my face.” I really agree! It’s especially how I felt in the opening scene. Thank you, Daniel. Here’s to hoping the third “Incredibles” movie will be made less than 10 years from now. A Jack-Jack spin-off would be cool, too.